Is there a character in fiction tougher and filled with more testosterone than Jack Reacher? I think not. Joe Pike, a recurring character in Robert Crais novels, would give Jack Reacher a run for his money, but Pike is more of a weapons guy, shotguns, Glocks, that sort of thing, whereas Jack Reacher can kill a man with his bare hands, or in the case of this novel, with his bare hand (singular). 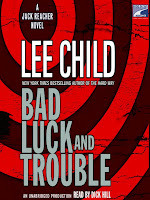 In this Reacher outing, Reacher gets a distress call from someone in his past, a member of the Specials Investigations Unit he ran during his military days. Turns out another member of the unit has been brutally murdered and others are missing. Reacher and team meet up in LA to solve the crime themselves and carry out some serious vengeance, Jack Reacher style. It’s a great read. Fast paced plot. Devious bad guys. A solid team of experts, each with their own talents and skills. And plenty of bang up action. What’s great about Jack Reacher is that he’s unapologetically violent. He’s not like the noble hero that Hollywood has created, the god guy who has the bad guy in his snare and could kill him easily but doesn’t because that would be “wrong.” That would be stooping to the bad guy’s level and no true hero would sink so low. No, our heroes have to be noble. Of course, the bad guy always exploits this nobility right at the last second and kills himself as a result. That way, we as the audience are pacified in seeing the bad guy get his just reward but also relieved to see that our hero was not responsible and therefore true to his squeaky clean nobility. Well Jack Reacher don’t play that game. If he finds a bad guy and that bad guy has served his purpose (ie. given Reacher the information he needs), Jack Reacher blows his brains out. Not because he’s psychotic. Not because he’s consumed with rage. But because that’s what needs to be done. Jack Reacher is a man who gets it done. And in Bad Luck and Trouble he lives up to his reputation.